Do Hamsters Have Long Tails? To the uninitiated, the differences between a hamster and a gerbil may not be clear. They're both small and furry, for instance; they're both rodents. In many aspects they look very much alike. The tail's the most obvious difference between the two. Hamster tails are significantly shorter. Hamsters do not have long tails, by any stretch of the imagination. The majority of hamster tails do not reach an inch in length. According to People for the Ethical Treatment of Animals, one of the defining physical characteristics of the hamster species is the tail. It's not just short as tails go; it has a stumpy overall look to it. If you spotted a cute, tiny, furry rodent with a long tail, you can rule out the possibility of it being a hamster. The rodent may be a gerbil, though. Gerbils in many ways look very similar to hamsters -- the main difference is the gerbil's significantly longer and more graceful tail. The tail of a gerbil usually is just as long as the animal's full body, which is about 4 inches long, according to the ASPCA. Although hamsters in general have stubby tails, certain breeds may have slightly longer tails than others. 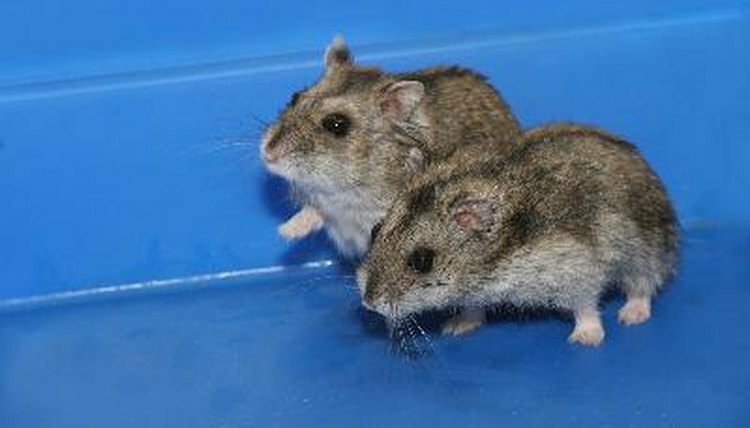 One such example is the Chinese hamster (Cricetulus griseus). Although most hamster tails measure a lot less than an inch long, Chinese hamster tails usually do reach a full length. Chinese hamster tails are markedly shorter than those of gerbils, but they're notably longer than the rest of their hammie counterparts'. Length isn't the only visual characteristic that separates hamsters from gerbils. Hamster tails are essentially hairless; gerbil tails have a fluffy appearance. If you're scratching your head in confusion trying to determine whether a little critter is a hamster or gerbil, study the tail. Note the length and examine the tail for signs of fur. Differences between hamsters and other rodents don't end with the tail. Hamsters, gerbils and other rodents, pets or otherwise, are distinctively separate animals of the Rodentia order. What Are the Physical Differences Between a Gerbil & Hamster? What Does a Hedgehog Look Like? What Family Do Hamsters Come From? What Are Some Physical Characteristics of Beavers? What Is the Difference Between a Teddy Bear Hamster & an Angora Hamster? What Kind of Fur Does a Chinchilla Have?